What Is an Anti-Siphon Faucet? An anti-siphon faucet prevents contaminated water from being back-washed into the main water supply. If water pressure unexpectedly drops, water may flow backwards and siphon into open pipes or fixtures (see Reference 1 below). Anti-siphon faucets should be used where a back-flow of water could cause a health hazard. 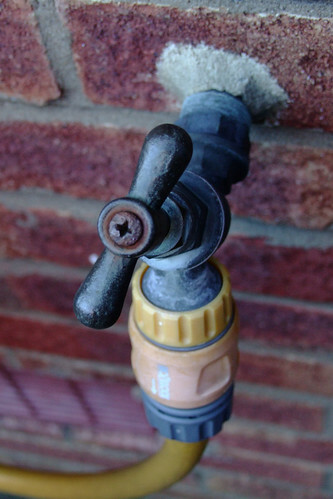 Common locations for anti-siphon faucets are outdoor garden hose connections, toilets and sprinkler systems (see Reference 4 below). An anti-siphon faucet includes a rubber seal that allows water to flow in only one direction (see Reference 2 below). Anti-siphon faucets are particularly important outside of houses. Chemicals are used for lawns, plants, and swimming pools, so it is critical that precautions be in place to prevent contaminated water from entering the water supply used for drinking, cooking, and bathing. An anti-siphon valve can be identified by looking for the UPC shield or the words "anti-siphon" on it. There also should be an air entrance visible at the top of the valve (see Reference 4 below). Anti-siphon faucets are required by federal housing code ASSE 1025 for residential use with a hose spray (see Reference 3 below). Sarah Dawn is a freelance writer and business professional who lives in Dallas. She has a bachelor's degree in business administration and a master's degree in human relations from the University of Oklahoma. She currently writes business, culture, education and health articles for Demand Studios. How Does a Freeze Proof Outdoor Faucet Work? What Is an OS & Y Gate Valve?